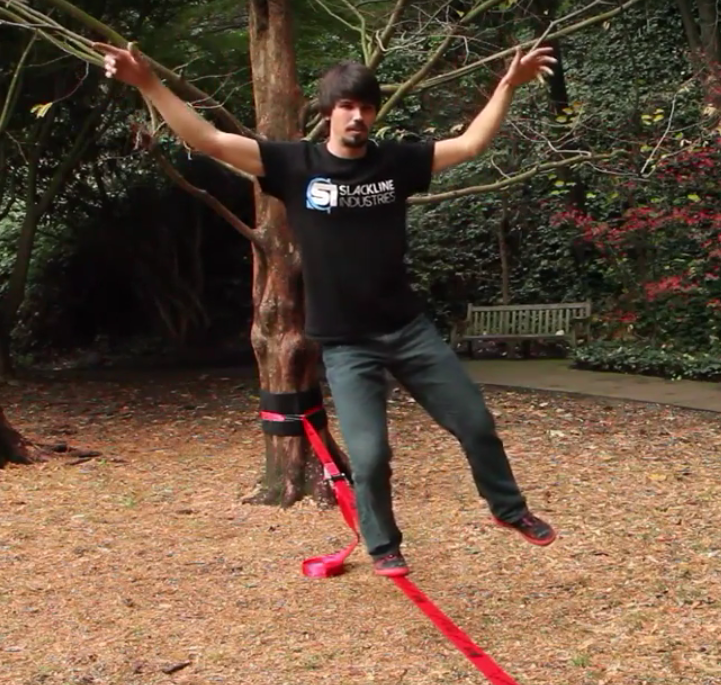 Slacklining looks easy, but even the basics such as walking from one end of the line to the other can take a lot of practice and patience. 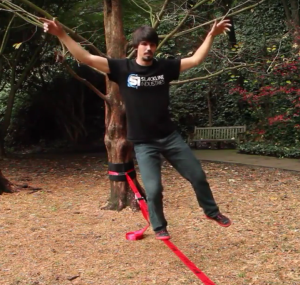 In this tutorial we offer some pointers as to the best way for beginners to start slacklining. 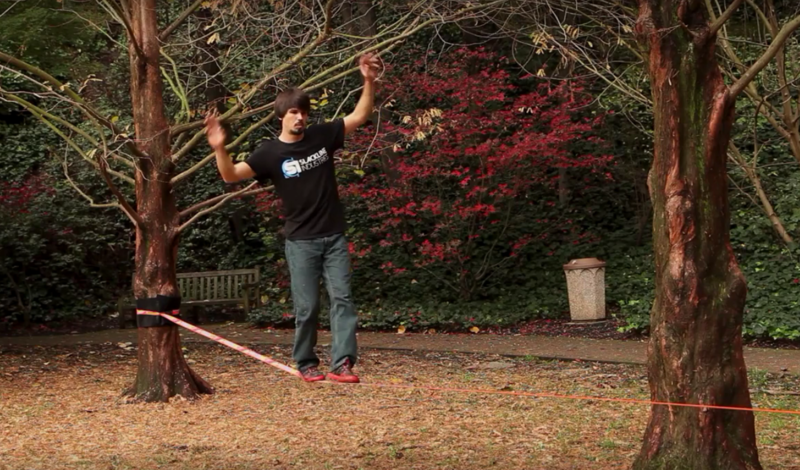 Setup your line at a fairly low level to begin with, around knee height will be fine. Ensure that your ratchet is properly locked and that the loose tail of the line is tied securely to the anchor point as a backup. If possible, it can be a good idea to use a training line as well, this is a secondary line attached above head height so that you can use your hands to help you maintain balance as you are learning the correct posture. Beginner slackers always ask us if it’s better to use shoes or to go barefoot. This is really a case of personal preference, by going barefoot you can feel the movements of the line better but shoes can protect you from cutting or scratching the skin of your feet on the line. Try both options and see which you prefer. Stand with the line next to you and position your body so that your shoulders are at 90 degrees to the line. This is the position that you need to try and maintain while standing and walking, do not twist your body so that you are standing sideways on the line as this is a much more difficult position to balance in. the direction of the line, not sideways across the line. elbows, you are going to use movement of your arms to help you balance. to feel that the line is shaking a lot when they first try to stand on the line. Don’t Look Down At Your Feet! The importance of this cannot be overstated. 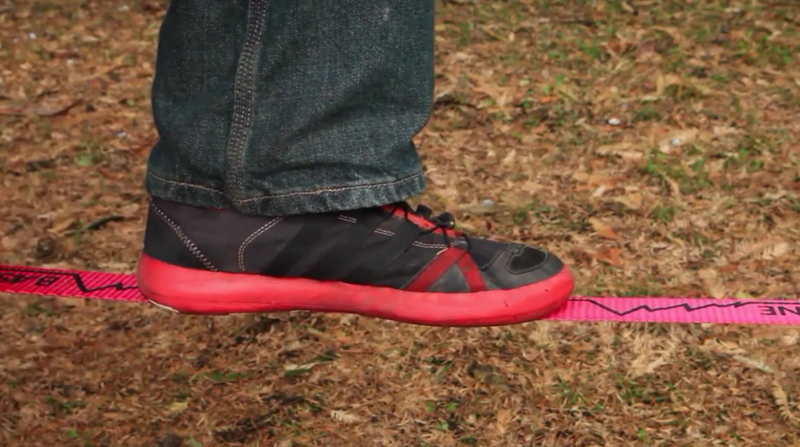 It is tempting to keep looking down at your feet while first learning to walk, don’t do it! 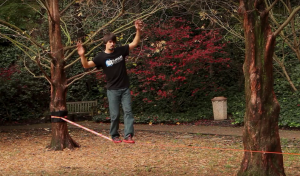 Instead fix your eyes on a stable point ahead of you, the opposite anchor point that the Slackline is attached to is usually a good stable point to focus on. 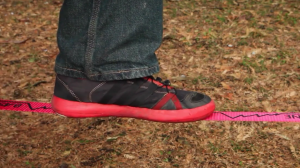 At this moment it is best to stay balancing on just one foot, do not try to get your other foot on the line. 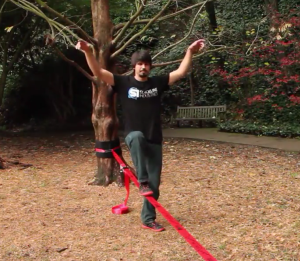 By balancing on one foot, you can use the movement of your other foot as a counter balance to compensate for your movements on the line. Try and just hold this position for the moment, don’t think about walking just yet. As the line moves and your body moves with it, use your arms bent at the elbows as counter balances to the movement. 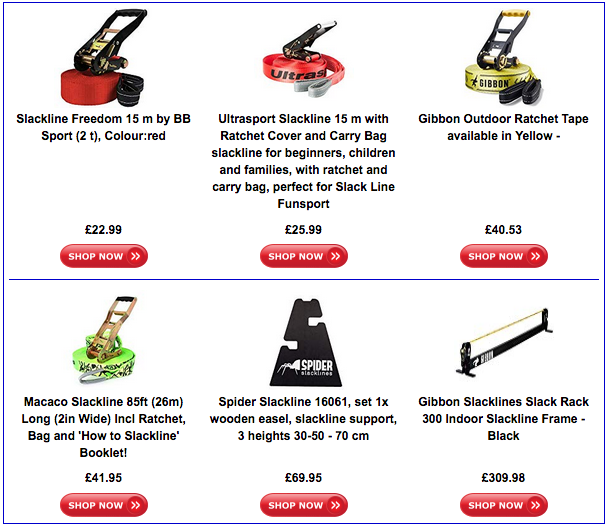 It is no coincidence that one of the largest Slackline Manufacturers is called Gibbon Slacklines. Think of the way that a Gibbon walks, with arms raised to aid balance, this is the kind of body position that you need to adopt. Your free leg can be also be used as a counter balance while you are trying to keep your balance on the line. Now simply try to hold this position, allowing your body to get used to the slight movements of the line. Keep using your arms and spare foot to compensate for the movements and to keep your balance. When you fall off, simply get back on and try again. Each time you try you will be building muscle memory and you will find that you quite quickly adapt to the movements of the line and are able to balance for longer. After a while (and this can be after minutes or hours depending on your natural balance) you will find that you are able to stand on one foot and hold that position for at least several seconds by using your arms and other foot to balance. Its time now to try walking, so maintain a comfortable balanced position. You will now have to repeat the steps mentioned in the previous paragraphs above: Stay on one foot, arms above head bent at the elbows and used in conjunction with the spare foot as a counter balance. It is very likely that on your weaker leg you will find that the line moves a lot when you try to balance, but as before, keep on trying and you will quickly build muscle memory which will allow you to balance. 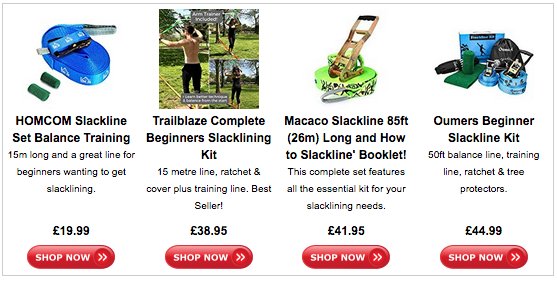 We are often asked “What is the best slackline for beginners?“. to harder disciplines such as trick-lining. you improve your mental focus.